German poetess and authoress; born at Breslau, Silesia, about 1770; died about 1814. 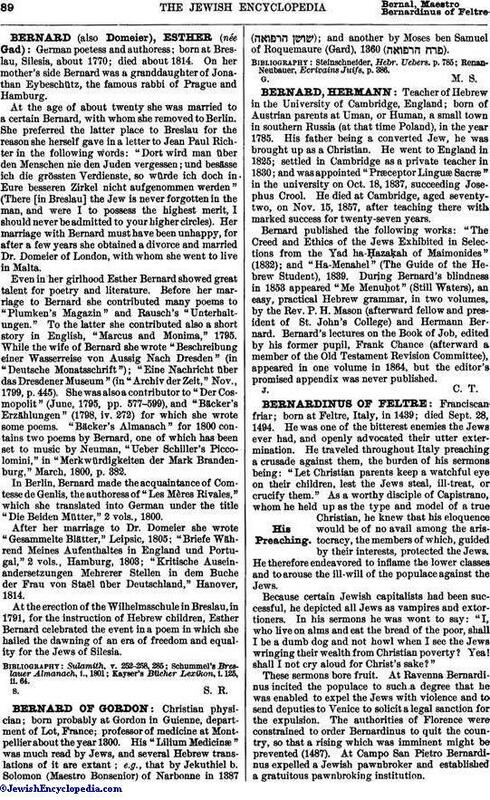 On her mother's side Bernard was a granddaughter of Jonathan Eybeschütz, the famous rabbi of Prague and Hamburg. At the age of about twenty she was married to a certain Bernard, with whom she removed to Berlin. She preferred the latter place to Breslau for the reason she herself gave in a letter to Jean Paul Richter in the following words: "Dort wird man über den Menschen nie den Juden vergessen; und besässe ich die grössten Verdienste, so würde ich doch in Eure besseren Zirkel nicht aufgenommen werden" (There [in Breslau] the Jew is never forgotten in the man, and were I to possess the highest merit, I should never be admitted to your higher circles). Her marriage with Bernard must have been unhappy, for after a few years she obtained a divorce and married Dr. Domeier of London, with whom she went to live in Malta. Even in her girlhood Esther Bernard showed great talent for poetry and literature. Before her marriage to Bernard she contributed many poems to "Plumken's Magazin" and Rausch's "Unterhaltungen." To the latter she contributed also a short story in English, "Marcus and Monima," 1795. While the wife of Bernard she wrote "Beschreibung einer Wasserreise von Aussig Nach Dresden" (in "Deutsche Monatsschrift"); "Eine Nachricht über das Dresdener Museum" (in "Archiv der Zeit," Nov., 1799, p. 445). She was also a contributor to "Der Cosmopolit" (June, 1795, pp. 577-599), and "Bäcker's Erzählungen" (1798, iv. 272) for which she wrote some poems. "Bäcker's Almanach" for 1800 contains two poems by Bernard, one of which has been set to music by Neuman, "Ueber Schiller's Piccolomini," in "Merkwürdigkeiten der Mark Brandenburg," March, 1800, p. 382. In Berlin, Bernard made the acquaintance of Comtesse de Genlis, the authoress of "Les Mères Rivales," which she translated into German under the title "Die Beiden Mütter," 2 vols., 1800. After her marriage to Dr. Domeier she wrote "Gesammelte Blätter," Leipsic, 1805; "Briefe Während Meines Aufenthaltes in England und Portugal," 2 vols., Hamburg, 1803; "Kritische Auseinandersetzungen Mehrerer Stellen in dem Buche der Frau von Staël über Deutschland," Hanover, 1814. At the erection of the Wilhelmsschule in Breslau, in 1791, for the instruction of Hebrew children, Esther Bernard celebrated the event in a poem in which she hailed the dawning of an era of freedom and equality for the Jews of Silesia. Kayser's Bücher Lexikon, i. 125, ii. 64.